The new Webster Chair is done! Sure, it doesn't have any webbing, but I'm not too worried. Lots of time to come up with a catchy new name. After finishing the frame a couple of weeks ago, the final step was to cushion and upholster the seat which was wrapped in a dark grey wool felt. The felt matches the Chicago bolts and adds a nice contrast to the light wood (ash I think). 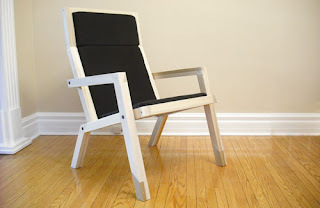 The Web 2.0 chair is meant as a low lounge chair that with a waterproof upholstery could sit well on a porch for some serious stooping. 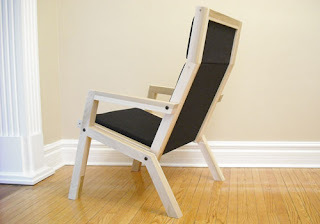 For now it serves as a relaxing reading chair in the living room (can't get a prototype wet!). I am very happy with this prototype, and would only have a few revisions for the next iteration. The proportions are a little off due to my sad lack of woodworking skills. 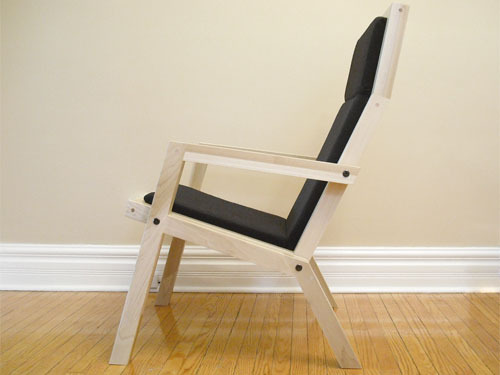 The chair should be slightly lower and more laid back, but there was an unfortunate incident involving one of the side pieces of the outer frame. There should also be a horizontal brace behind where the seat meets the back for structure and to frame in the back panel. The next step is to add rocking chair legs. Due to the Chicago bolts between the inner frame and leg/arm pieces, it will be very easy to interchange different styles of legs depending on my mood. Which is almost always surly.